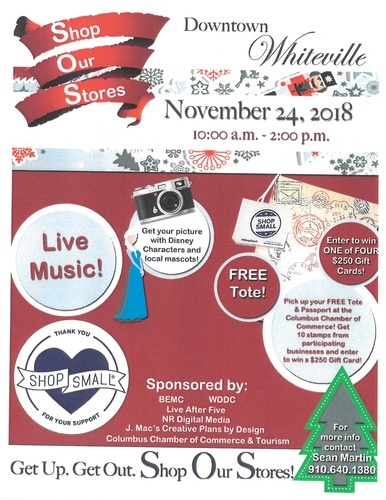 Shop Our Stores on November 24, 2018 in Downtown Whiteville from 10:00 a.m. to 2:00 p.m.
Get your picture with Disney Characters and local mascots! Pick up your FREE Tote & Passport at the Columbus Chamber of Commerce! Get 10 stamps from participating businesses and enter to win a $250 Gift Card!!!! Get up. Get Out. Shop Our Stores!